Despite being notably buggy and in desperate need of a patch (which is coming soon BTW), Vegas has shipped five million copies worldwide and when you factor in digital downloads- has $300 mil worth of sales in it's pockets. 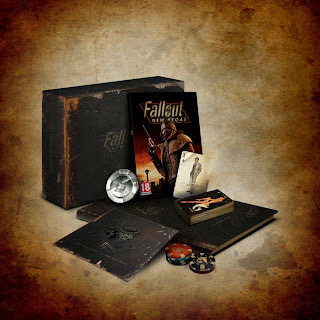 Bethesda Softworks®, a ZeniMax Media company, announced today that its highly anticipated title, Fallout®: New Vegas, has enjoyed record sales at launch, reflecting the huge consumer demand for the game. Five million units of Fallout: New Vegas were shipped worldwide for the Xbox 360®video game and entertainment system from Microsoft, PlayStation®3 computer entertainment system, and Games for Windows®, with a heavy volume of digital downloads, representing well over $300 million in retail sales. In addition, the Fallout: New Vegas strategy guide was one of Amazon’s best sellers among all books. Fallout: New Vegas, the follow-up to Fallout 3 – the 2008 Game of the Year – brings this beloved franchise to a location only Fallout could do justice: Vegas. Fallout: New Vegas takes all the action, humour and post-apocalyptic grime and grit of this legendary series, and raises the stakes. For more information on Fallout: New Vegas, visit http://fallout.bethsoft.com.